I needed a good book to read during my last trip to Hawaii. Fiction, literature, nothing really felt right. When I’m traveling I want a travelogue, a travel memoir, something with a little adventure, not a fictional story. 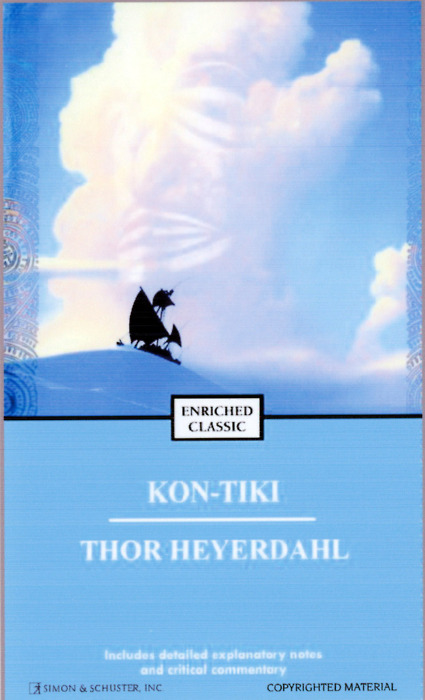 And the one that stood out, the only one which seemed appropriate, was one of the bestselling books of all-time – Thor Heyerdahl’s Kon-Tiki. It surprised me to learn it has sold approximately 20 million copies since it was published in 1950. What surprised me even more, though, is that I had yet to read it. A trip to Hawaii seemed like the perfect opportunity to do so, since it’s about a theory Heyerdahl had about how the Polynesian islands – Easter Island, Tahiti, and thus Hawaii – were populated from the east, from Peru, instead of from lands in the west, like Asia. With a flight delay on the way over, I had plenty of time to dig into Kon-Tiki’s pages. What I expected, despite the relatively recent publish date, was a difficult read with a bunch of nautical talk that would go way over my head. Instead, what I found was a really well-written book with a conversational tone that is easy to read. Heyerdahl and F.H. Lyon – the translator for the edition I read – did an excellent job keeping it like this while also maintaining the integrity of the story, the theory Heyerdahl was attempting to prove. Heyerdahl could not have written a better story or finished it in a better fashion. And the addition of the supplemental biography and pictures only add to my interest of the story. My one complaint, though, and I only mention it because I feel no story can or should be perfect, is that it is never explained in either the story or the supplemental information what happened to Kon-Tiki, the raft named after the Incan sun god. So, after closing the book’s covers, I had to go online to find out for myself. I don’t want to ruin it for anyone, so if you want to know you can find out here. Kon-Tiki by Thor Heyerdahl really is one of the best travel / adventure books ever written. And it’s a shame I didn’t pick it up sooner. That’s all taken care of now, though, since I read it while in Hawaii, barely a more appropriate spot existing on the whole planet. But regardless of where you are, if you’re interested in travel books, which I’m assuming you are if you’ve been reading this site, then I suggest picking up a copy and give it a look see. Thanks for the tip. Always looking for interesting travel writing.